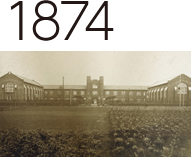 Rikkyo University started in 1874 as RikkyoSchool, a small private school teachingEnglish and Bible studies in the foreignsettlement in Tsukiji, Tokyo. The School wasfounded by Bishop Channing Moore Williams,a missionary dispatched from the AmericanEpiscopal Church. 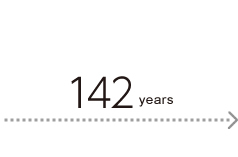 Nearly 142 years later,Rikkyo University today still retains itstradition of education modeled on theWestern traditional liberal arts college. Basedon the founding principle of “Pro Deo etPatria” (For God and Nation), the Universityoffers education based upon humanisticvalues and Christian concern for others. Bishop Williams wasborn in Richmond,Virginia on July 18, 1829.He was appointed amissionary to China andarrived in Shanghai inJune 1856. In June 1859,he was dispatched toNagasaki. Aftertemporarily returning to the U.S. in 1866,Bishop Williams opened a small privateschool in Tsukiji, Tokyo in February 1874,which became the predecessor of RikkyoUniversity. He passed away in his hometownof Richmond in 1910 at the age of 81. Rikkyo University isknown for its welcomingschool environment. Thestudent population issmall compared to otheruniversities, and there isactive communicationamong faculty, staff, andstudents. Rikkyo is acaring university. 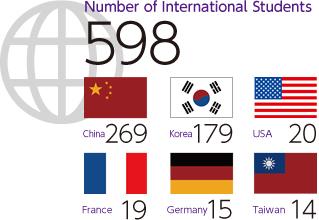 The number ofinternational students atRikkyo (currently around600) is expected toincrease to 1,000 by the2019 academic year, andto 2,000 by the 2024academic year. Throughthe globalization of thecampus, students willgain exposure to avariety of cultures andlanguages. Rikkyo University has beenselected for “Top GlobalUniversity Project (GlobalTraction Type)” by theMinistry of Education,Culture, Sports, Science andTechnology (MEXT). Thisproject, initiated in 2014, isbeing implemented tostrengthen the internationalcompetitiveness of universities in Japan. To this end,the project is providing priority support touniversities dedicated to thoroughinternationalization and university reforms. Theuniversity is making further improvements andadvances in unique initiatives, such as the liberal artseducation it has been providing for 140 years and itspioneering leadership education, and working tocreate a world-class educational system byengaging in dialogue with liberal arts universities inEurope and America. The Ikebukuro Library, the Niiza Library, and the NiizaRepository Library have a collection of over 1.76million Japanese and overseas publications, includingbooks, magazines, and newspapers. All threelibraries provide plenty of seating and offer acomfortable learning environment equipped withreading spaces, PC stations, and AV booths that aretailored to students’ different browsing styles andaccess hours. Global Lounge, the hub for international exchanges andstudy abroad program information, has beenestablished at both the Ikebukuro and Niiza Campuses.Coordinators offer a full lineup of consultation servicesdesigned to help students choose what is best forthem from a variety of study abroadprograms. Services include provision of basic studyabroad information, consultations on study abroaddestinations, and support for developing study abroadplans. Global Lounge also holds events to promoteinteraction among Japanese and international students. Rikkyo University inaugurated a prayer room on theuniversity’s Ikebukuro Campus in April 2016 tobetter serve the needs of the university’s increasingnumber of international students. While this facilityhas been designed primarily for Muslim studentsfrom overseas, it is available for use by followers ofall faiths. In the Graduate School of Business’s Master ofInternational Business (MIB) program, all subjects aretaught in English. The College of InterculturalCommunication has created a “Dual LanguagePathway” (DLP) program under which all its specializedcourses can be taken in English. 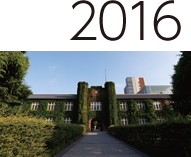 Rikkyo University willbe increasing the number of courses offered in Englishat both the graduate and undergraduate levels. CJLE offers Japanese language education customizedfor international students. It provides students withopportunities to learn about different aspects ofJapanese culture and Japanese language. In addition,CJLE has established the Japanese LanguageSupport Desk to help students whose nativelanguage is not Japanese. In the 2015 academic year, 64% of privatelyfinanced international students receivedscholarship assistance. Details of thescholarship recipients for 2015 are shownbelow. 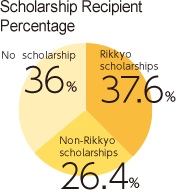 Rikkyo is not able to guaranteefi nancial assistance to all internationalstudents, so all applications should establishtheir own financial plans to make theirstudies in Japan an enriching experience.